The start of the coming week promises to deliver more weather adventures for Colorado. As I already mentioned last week, eastern Colorado could see temperatures well below normal by the middle of the week as an upper level closed low digs in across the Great Lakes. The greatest temperature anomalies appear to be in store for Wednesday, when temperatures could be anywhere from 10 to 30 degrees F below normal across portions of eastern Colorado and into Kansas. Denver will be right on the line for the coldest temps relative to normal -- with a sharp east/west gradient between cooler temperatures (east) and slightly below normal (west). The big question over the last week has been just how far west the cold pool gets. Today’s 12z ECMWF didn’t back down with this shot of cool air across eastern Colorado, and the GFS looks fairly similar -- though it keeps the core of the coldest temperatures east of where the EURO has them. With either scenario, the greatest negative temperature anomalies will be well east of Denver, but we’re liable to still see well below normal temperatures for Front Range communities as well. Responsible for this (taste of fall?) is an uncommonly strong (for this time of year) upper level low that will dip south Tuesday across the Great Lakes, ushering in chilly air for the Plains states by midweek. Highs Wednesday may not make it out of the mid 60s across portions of Western Kansas and extreme eastern Colorado, with 70s expected for highs in Denver for now. Storms remain in the forecast at least through Wednesday for eastern Colorado. Storm chances Monday will be very similar to today (mostly in the 30% range), with the possibility of a storm or two becoming severe. 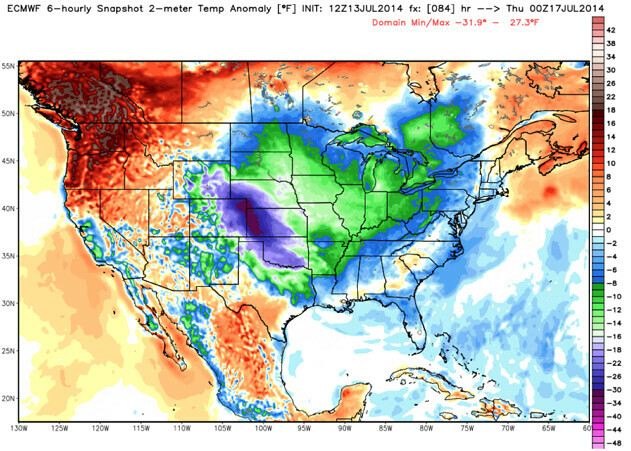 Precipitable Water values rise again for Tuesday, with the GFS at >1” for most of the plains by Tuesday afternoon. PWAT values stay high for Wednesday, before we gradually start to dry things out a bit to end the week. Greater available moisture, the incoming cold front, and recent rains will heighten flash flooding potential as well for Tuesday into Wednesday as well. While recent burn scars are of greatest concerns, this type of setup can produce flood potential with just about any storm that develops. Please be wary. As it stands, it looks like Tuesday will offer the greatest risk for severe storms, though impossible to rule out severe storms the other days as well. Tuesday will have the most ingredients in play as yet another short wave trough moves through. CAPE values are forecast to be greater than 2000, dew points in the upper 50s and low 60s, and shear. 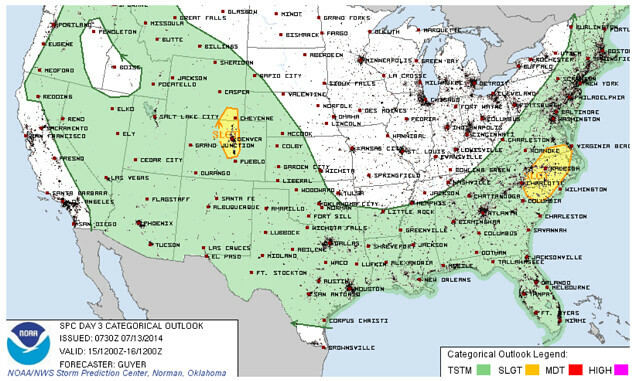 Certainly still a lot to watch over the next 24 to 36 hours, but the SPC has issued a slight risk for severe weather Tuesday across the urban corridor and Front Range foothills. Greatest threats will be strong winds and damaging hail, but an isolated tornado cannot be ruled either. We’ll keep a close eye on things and update as necessary. In short, plan for more storms to start the week (some severe) and cooler temperatures for Tuesday and Wednesday. If you’ve not subscribed to Weather5280, please do(! ), and follow us on Twitter (@weather5280) for all the latest updates. Medium range models continue to show us drying out and warming again by the end of the week and next weekend. Expect temperatures to gradually rise into the weekend, with the potential for a return of the heat by early next week. Given the pattern, it seems prudent to wait-and-see a few more days before getting too caught up on hot and dry.